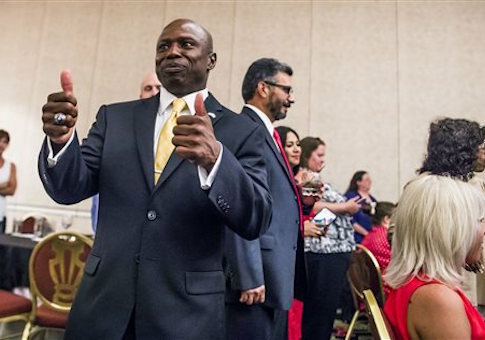 Colorado Republican Senate nominee Darryl Glenn said the Democratic Party has taken African Americans for granted, during a speech at the Western Conservative Summit last week. Glenn vowed to reach out to the African American community when seeking votes in his November challenge against Democratic incumbent Sen. Michael Bennet. "I plan on going into those neighborhoods that Republicans traditionally won’t go," Glenn said. "I plan on going into those same neighborhoods that Democrats basically take us for granted. They think just because, ‘Hey, you’re black you’re supposed to vote for the Democrats.’ That’s wrong." Glenn, a black conservative, also contrasted himself with Jesse Jackson and Al Sharpton. "We need to start standing up for freedom and liberty. I’m still waiting for Jesse Jackson and Al Sharpton to come," he said. "You know, Al Sharpton who doesn’t even pay for his own suits. These people—I’m going to highlight them—do not speak for me. They don’t speak for all black people. We need to shine the light on them." "We need to show the fact that when you start thinking about freedom and liberty, personal responsibility and opportunity to achieve the American Dream, the Republican party is the best party to do that," Glenn said. "Let’s stand for that." Glenn is known for his fiery speaking style, which helped him win a crowded Republican primary last month. Glenn captured a spot on the ballot after delivering an impassioned speech at the GOP convention in April. This entry was posted in Politics and tagged 2016 Election, Darryl Glenn. Bookmark the permalink.